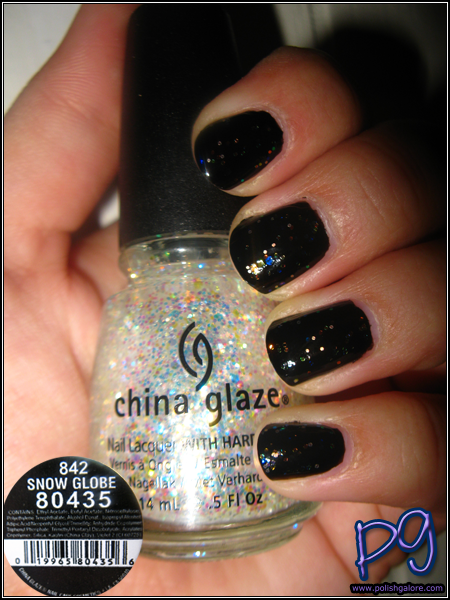 China Glaze Snow Globe is a repromote glitter from the Specialty Collection (also called Glitters & Cremes) that came out in 2009. It's been featured in the Winter 2011 Let It Snow collection. This has a mix of different colored and different hexagonal sized iridescent glitter pieces. 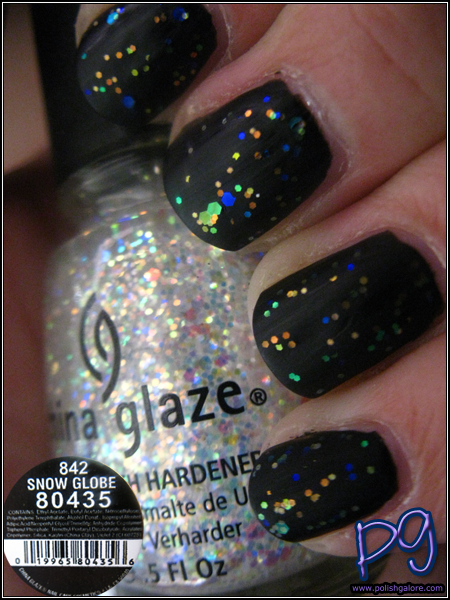 I used my previous Noir manicure (thank you nubar!) and just added one coat of Snow Globe. As you can see, I'm back to cloudy days. I topped the manicure with Seche Vite. One coat just isn't really enough - the glitter didn't really spread like I'd want it to. Indoors with the flash pretty much swallows up all the glitter. I decided to add a coat of ManGlaze #Matte Astrophe to see if it would bring out the glitter more and can we say mission accomplished? I think this is my favorite view of this glitter. im blown away at how it looks mattified. i need to do that asap!